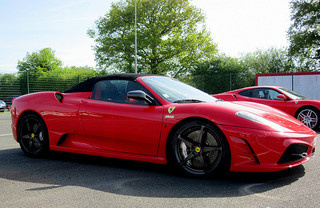 The Scuderia Spider 16M sports car was launched by Ferrari in November 2008 to celebrate yet another victory (the sixteenth, and hence the title) in the Formula One Constructor's World Championship. This feat was commemorated by the addition of a unique plaque at the rear of the car, whilst a further insignia, depicting the accolade "Limited Series", was positioned on the dashboard. 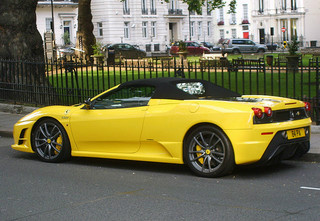 Limited to 499 units it was, in essence, the convertible variant of the 430 Scuderia introduced a year earlier. It weighed in at 1340 kg net, some 80 kg lighter than the F430 Spider. This was achieved by the extensive use of carbon fibre components, adding lightweight front and rear bumpers, and specially designed 19 inch five spoke forged alloy wheels. The chassis received additional strengthening to compensate for the extra output, together with larger carbon ceramic front disc brakes and callipers. The five switch Manettino, positioned on the steering wheel, was retained to integrate the F1-style gearbox with the CST and F1-Trac, the stability and traction control systems, which incorporated the electronic limited slip differnetial, E-Diff. 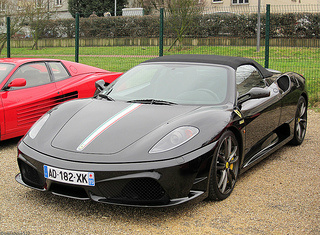 Apart from the standard colour scheme of a black body coupled with grey trim, there was an alternative available to the Scuderia Spider 16M and consisted of a format involving three distinct colours. 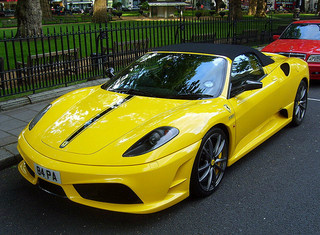 Another feature was the inclusion of a new generation of audio system in which it could be linked to a customised Ferrari iPod. The Scuderia Spider 16M was powered by the same 4.3 litre, V8 mid-engine, as used in the 430 Scuderia, and delivered 510 bhp at 8500 rpm (redline 8640), and 347 ft/lbs of torque at 5250 rpm. With a compression ratio of 11.9:1 and fitted with a six speed F1-style paddle shift gearbox, this produced a top speed of 196 mph, and a 0-60 mph time of 3.6 secs. 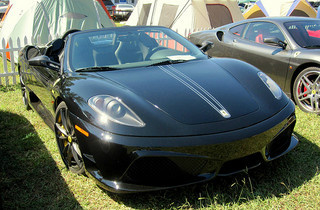 As expected, performance was slightly down on the F430 Scuderia. A Ferrari Scuderia Spider 16M in good condition would fetch around $180,000, whilst one in showroom condition would command in the region of $350,000. More examples of classic cars from Ferrari.